Milan's Motorcycles offers an extensive and ever changing inventory of 1942 Harley Davidson XA parts and accessories available for purchase or we may consider a trade. 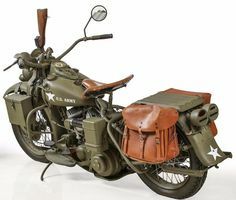 A limited inventory of parts and accessories for military and civilian models is available at Milan's Motorcycles. Contact us with your parts request. After decades of searching for motorcycle parts, Milan's Motorcycles treasures include a few select items for some vintage H-D motorcycles. Panhead, Knucklehead and Shovelhead. Let us know what you are looking for. Milan grew up under the strict rule of communist Czechoslovakia. At the age of 17 he purchased a 1942 Harley Davidson WLC. After only a few months the engine died. At that time, there was absolutely no access to parts from the western world. That forced him to learn how to manufacture; bearings, gears, pistons etc. Milan became a HD 45 expert. Let us know what you are looking for & we will do what we can to find it for you.